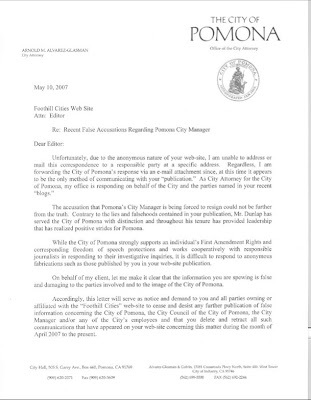 A while ago we floated some rumors circulating via email concerning certain goings on in Pomona's city hall. We figured the accusations were so far out there that they wouldn't cause any harm, and we figured we'd learn more about what was going on by asking our readers about them. We also sent emails to all the parties concerned. We eventually decided that posting the name of one of the parties in question would be unfair, so we removed the name of that city employee from our little blog. Although we were able to maintain private email correspondence with that person, the City of Pomona made sure that all our emails to city officials were sent back to us as spam. We've decided to remove almost all the posts concerning this incident from our "web-site publication," as the city attorney called Foothill Cities in his uncharitable letter-in-a-pdf file to us yesterday. He sent it, he says, "on behalf of the city and the parties named in your recent 'blogs.'" I don't think we've done anything wrong, and I think we would likely be fine facing the threatened "legal consequences." But, of course, such a process would be time consuming and costly�assuming the city actually carried through with it�and, frankly, considering this is a very part-time gig, and we don't exactly have the resources the city of Pomona does, we're going to let Goliath win this one. A commenter on the blog posts: "Sometimes even I'm amazed. So a little chatter on your site provokes a 'cease and desist' letter. That's excellent p.r., by Pomona, especially if you want the press to wonder what's the hub-bub. Like I am now." Here are some of the comments from the original, since-pulled post. And here's a post where Foothill Cities noticed that its email to city employees suddenly began getting spam filtered.